Define Activities process is the second process of Time Management knowledge area coming after the Plan Schedule Management process. Time Management has an important part in the PMP exam questions. 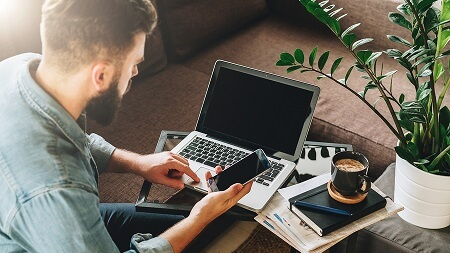 So if you are enrolled in a PMP exam training you will have a thorough information about this knowledge area and also about its processes such as the Define Activities process. Let’s review what is Define Activities Process, what are the outputs and give a real-life example of how Define Activities process is conducted during the project life cycle. What Is Define Activities Process? In order to complete a project, a certain set of activities must be performed by the project team members. 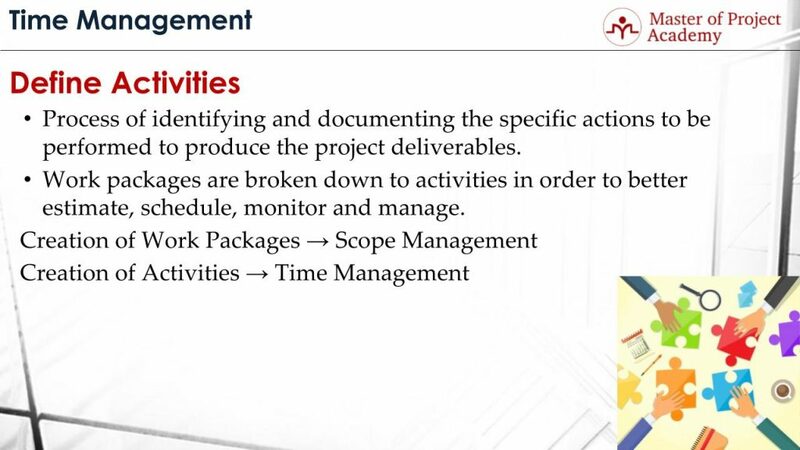 According to the PMP Training, Define Activities is the process of identifying and documenting the specific actions to be performed to produce the project deliverables. During define activities process, based on the determined scope, activities that must be performed to reach the project goals and objectives are defined. These activities are usually as small as to be completed in hours or in days. 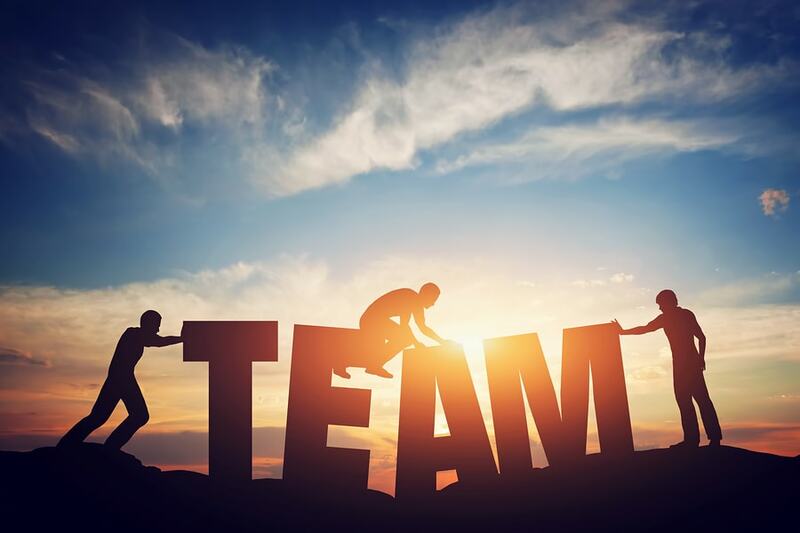 Because these activities will be performed by project team members and they should be as small as possible in order to manage and project better. Work packages are broken down into activities in order to be better estimated, scheduled, monitored and managed. Work packages show a small interim deliverable or work that needs to be completed. But activities are small parts of each work package. The work package can be completed by completing all activities belonging to it. Breaking down the work packages to activities will help better and more accurate estimation, management and coordination in a project respectively. Because each activity will be very small like installation of a PC, development of a simple screen, etc. And assignees of these activities will be more confident during estimation. Creation of Work Packages is completed in the scope of Scope Management knowledge area but, these work packages are turned into activities in Time Management knowledge area in the Define Activities process. In order to define activities in a project, you need scope baseline. 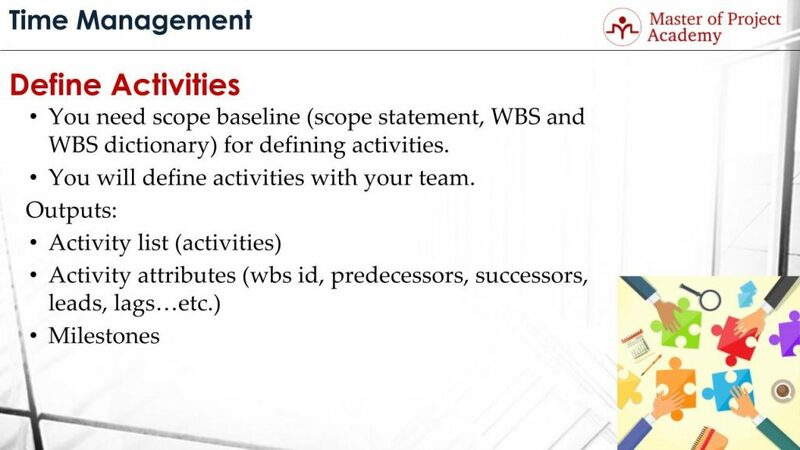 Scope baseline includes project scope statement, WBS and WBS dictionary. Scope statement describes the high-level information about the scope of the project. WBS shows the work and deliverable hierarchy of the project, and WBS dictionary provides detailed information about the work packages. Therefore, when defining activities under a work package, this information will be very useful during define activities process. Define activities process is completed with the help of the project team. Because the project team will perform the project activities. They will define the project activities that need to be performed to complete a work package, based on the project scope and determined work packages in the WBS. What are the outputs of Define Activities process? There are three main outputs of Define Activities process. What are they? The primary output of the Define Activities process is Activity List. Activity list includes the project activities that need to be performed in order to complete the project scope. This list includes activity names briefly such as install database, configure the database, execute creation scripts etc. 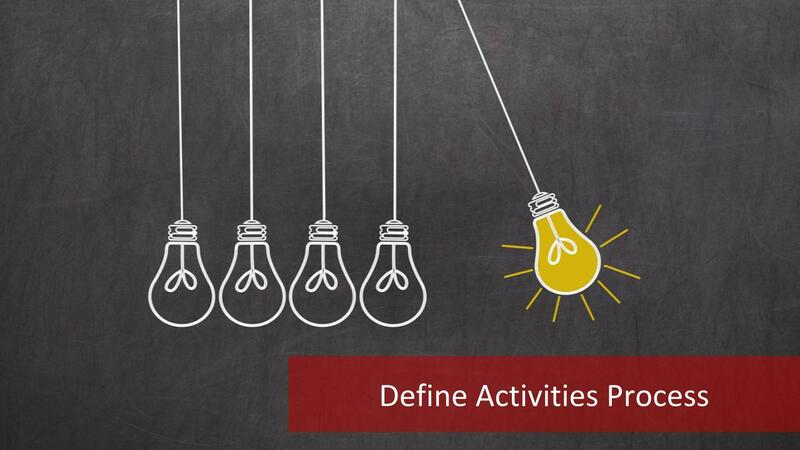 Activity attributes is another output of Define Activities process and it complements the activity list. WBS ID of the activity, predecessors or successors of activity, leads, and lags are highlighted in the activity attributes of each activity. The last output of Define Activities process is Milestones. 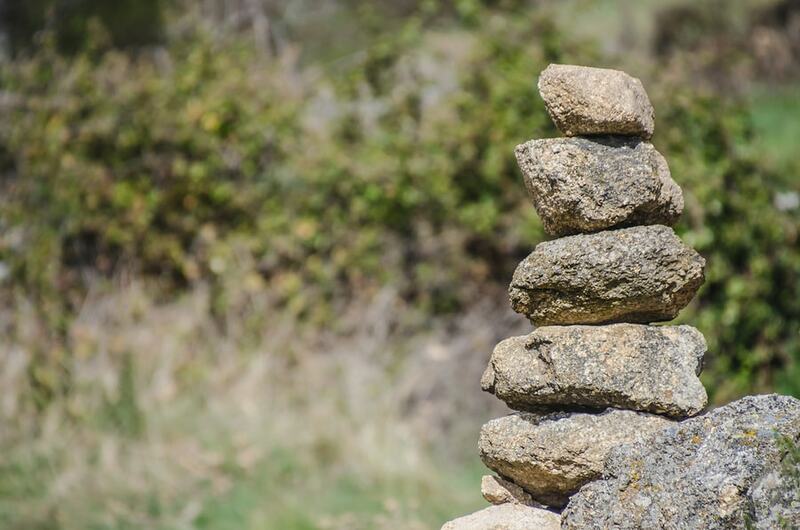 Milestones are not an activity and generally not assigned to any resource. But they reflect a significant point in the project. For a software project, sample milestones can be the completion of the analysis, the completion of design and development, the completion of tests, handover to customer etc. 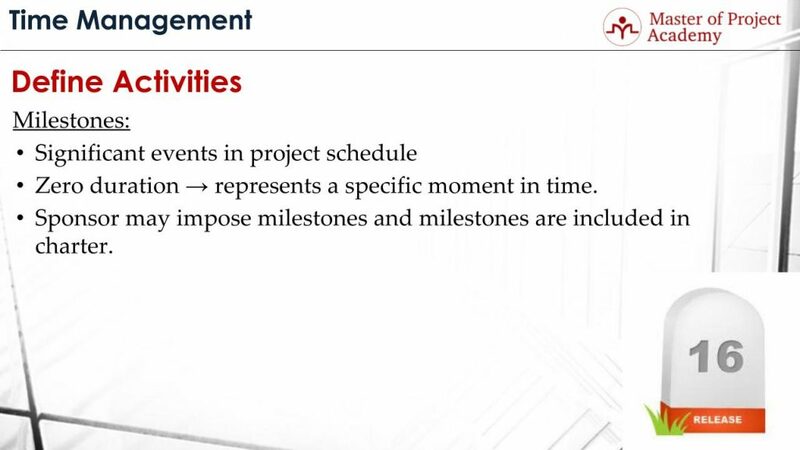 The milestones are significant events in the project schedule. Milestones have zero duration and represent a specific moment in time. Since they reflect a moment, they are not assigned to a project resource or they do not have a duration. The sponsor of the project may impose milestones and milestones are included in the charter. For instance, product launch is an important milestone and this can be imposed by the sponsor. There can be several milestones in a project but keeping the list short and showing the progress completions over these milestones will ease your progress reporting and communication with stakeholders respectively. Now, let’s go over a sample define activities process. Our sample project is Billing System Development for a utility service provider. It will include 3 major systems: Charging System, Database, and Invoicing System. And the invoicing system has 1 screen and 1 sub-system: invoice verification system. Let’s assume that you are defining the activities of invoicing screen work package. This means that, after completing these 4 activities, invoicing screen work package will be completed. These activities can be assigned to project team members. 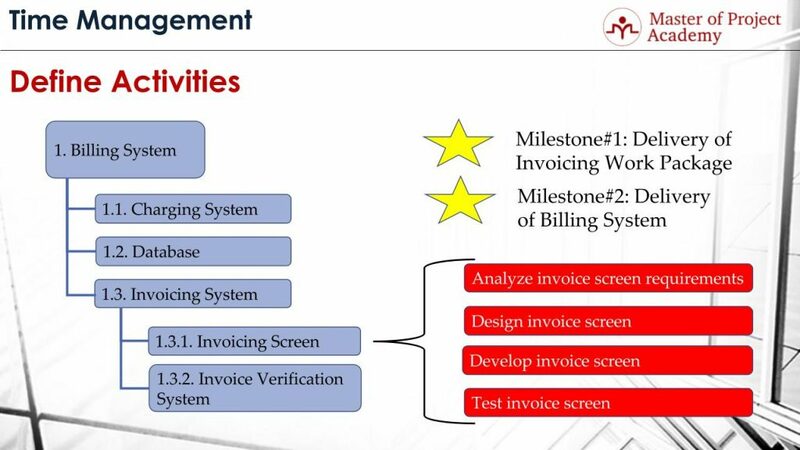 For instance, analyze invoice screen activity can be done by the analyst of the project, design invoice screen can be completed by architect or designer, develop invoice screen can be completed by software developer and test invoice screen can be completed by a test engineer. Milestone #2 Delivery of the Billing system. Depending on the sponsor’s approach and project dynamics, there can be several milestones. These are to illustrate how define activities process will take place in a sample project and provide sample milestones respectively. We explained Define Activities process of Time Management. Briefly, Define Activities process identifies and documents the actions to be performed for producing the project deliverables.